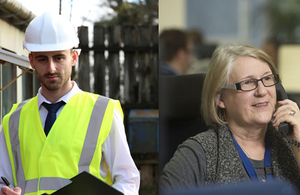 Find out more about the work we do and the opportunities we have on offer. We wanted to make it easier to find information about career opportunities in the Civil Service, to help people find the right job or next move for them. So, over the last 4 months, we’ve been working with colleagues across government to develop a VOA page on the Civil Service Careers website. This site is a ‘one stop shop’ for government departments which will enable us, to improve the diversity of our workforce further, and realise our vision of being a Brilliant Civil Service department. Our page gives potential applicants a positive, honest, reliable and relatable insight into working for the Agency. It aims to inform and inspire, and is designed to engage a diverse audience through showcasing our people, culture and values. Take a look at the site and tell us what you think. Also, feel free to share the site with friends and family, so they can learn about the VOA too.